Just by adding some exciting looking new dress shirts to your fashion arsenal, you can really improve how you look when you get dressed up. Why not try some of the latest Italian style dress shirts by Daniel Ellissa. 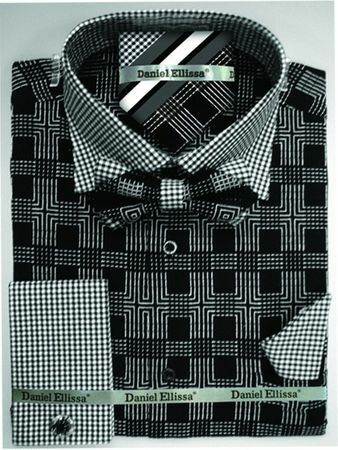 Daniel Ellissa is known for making stylish looking shirts for men that bring the party with you wherever you want to be. This bold black plaid dress shirt features contrasting french cuffs and collar and comes with the bow tie and neck tie as well for a complete look.